Old Law Tenements are tenements built in New York City after the Tenement House Act of 1879 and before the New York State Tenement House Act ("New Law") of 1901. The 1879 law required that every habitable room have a window opening to plain air, a requirement that was met by including air shafts between adjacent buildings. 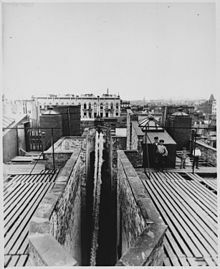 Old Law Tenements are commonly called "dumbbell tenements" after the shape of the building footprint: the air shaft gives each tenement the narrow-waisted shape of a dumbbell, wide facing the street and backyard, narrowed in between to create the air corridor. They were built in great numbers to accommodate waves of immigrating Europeans. The early 21st century side streets of Manhattan's Lower East Side are still lined with numerous dumbbell structures. The 1879 Act was a response to the failure of the Tenement House Act of 1867, which required fire escapes from each suite as well as windows in each room. Builders met the letter of the 1867 law by merely inserting meaningless windows between interior rooms. Without air shafts, the 1867 requirement failed to increase natural light or fresh air ventilation in the crowded tenement "dark bedroom". Responding to the new requirements, a magazine, Plumbing and Sanitation Engineer, held a tenement design contest in 1879. James Ware's winning dumbbell design represented a compromise between legal health standards and commercial viability. By indenting the sides of the structure three feet, he opened a slender airshaft between abutting buildings. The three-foot indentation required only a minimal sacrifice of rent-revenue space, placating the landlords, and provided just enough aperture for ventilation and natural, if not direct, light. The 1879 Act, though well-intentioned, failed even worse than the 1867 Act. Tenement dwellers tossed garbage, bilge water and waste into these air shafts which were not designed for garbage removal. As a result, the law's attempt to improve sanitation only created a new sanitation problem. Worse, the air shaft acted as a flue spreading fire from apartment to apartment. The 1901 law did away with the air shaft, replacing it with the large courtyard for garbage storage and removal. In later structures, the introduction of elevators reduced garbage defenestration by upper-story tenants. Stylistically, Old Law Tenements are unique and conspicuous. Though each uniformly occupies a twenty-five-foot lot just like the pre-Old Law tenement, the Old Law facade – with its fanciful sandstone human and animal gargoyles (sometimes in full figure), its terracotta filigree of no apparent historical precedent, its occasional design aberrations (e.g., dwarf columns), and its often varicolored brick – departs radically from the plain, dignified simplicity of the unassuming and largely unornamented older structures. Later in the Old Law period, the ornaments settle into a Queen Anne style, as the human representational forms gradually disappear into the more abstract extravagance of the following Beaux Arts style. The symmetrical floor plan of the typical Old Law Tenement included four virtually identical apartments per floor, three rooms each, with the entry opening to the kitchen containing a washtub alongside a sink opposite a wood-burning stove feeding into a flue. Two bathrooms were located on the landing in the hallway for common use. ^ White, Norval; Elliot Willensky (2000). AIA Guide to New York City 4th ed. New York: Crown. This page was last edited on 18 November 2018, at 18:44 (UTC).